Makeup . Nail Polish . Personal . Stash . it was a nice occasion to do one myself. As I was packing my polishes I snapped a few photographs. Please excuse the poor lighting, I did this late in the evening two days before the move, and we had already taken off the main lights of the house, so I only had a couple of desk lamps for lighting. 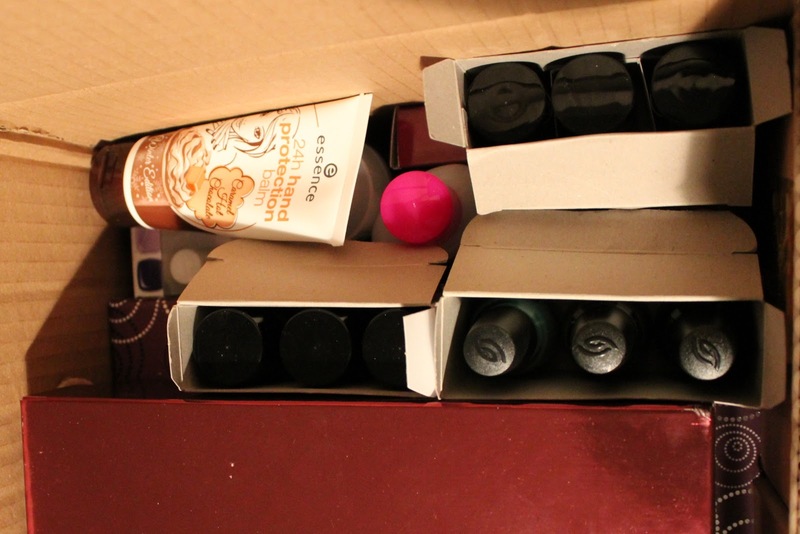 My whole nail polish collection fits a small carton box. I decided I was going to pack the bottles in smaller boxes and fit them in a bigger one, so they would be better protected. (You can enlarge all the pictures). First there are most of my Essie polishes in regular size. 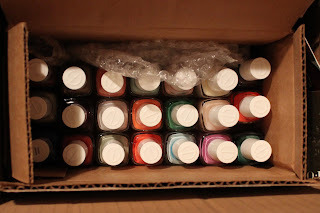 Then a small box with more Essie and Zoya (I don't own many), and some mini-sets in the corner. Here it is a box with about half of my OPIs. Then a decorated box where I started keeping my collection that now contains mixed brands polishes: Essesnce, Mavala, Revlon, H&M, Catrice, American Apparel, and other drugstore brands. Then there is another box that contains my Chanel, Dior and YSL varnishes. This was a perfume set box, quite sturdy that finished holding my nail art liner polishes, NYX glitter and special topcoats, Essence special effect and some nail art stuff like striping tape, rhinestones, fimo, glitter and glue. Next is how all could fit one box, and added some China Glaze and polish remover. 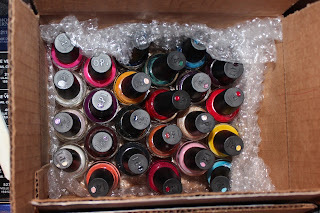 Then another small box with about the other half of my OPI. This small box contains most of my Catrice and some China Glaze. Some more Catrice and China glaze in tiny boxes. And the final carton box fitting all the above!! Gracias Mari! Tienes razón, no veo la hora de ponerlos en sus cajoncitos, jaja. Pero desempacar la cocina, la habitación del niño, las ropas, las cosas de higiene personal, limpiar, todo viene antes!! Very fun to see them all like this!! Hi Jezz, yes, that's certainly a lot! wow, what an collection! i'll have to move in about 6 months, i dread even the thought of it! Oh, Shine Eye, how I understand you! good luck! Hi citygirl907, THANKS! I've never been nominated for an award before, it's so cool! Hi Ithfifi!You're right on everything, that is maybe too much, I do have trouble deciding and I should be getting a rest! Aw, I hope you're feeling less tired today! Moving is such a fun thing but it's so much work!! Let it take time, it's a short period of time anyway in your life, the unpacking of the stuff!